There's no tougher origin for a superhero to endure than the ones which require them to snuff it before they even get out of the gate. 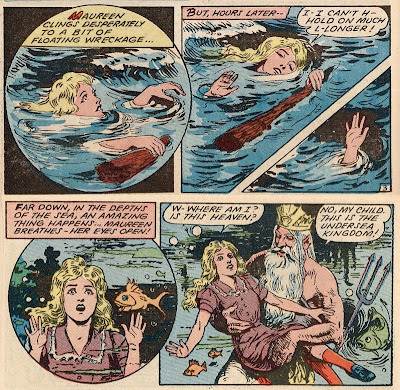 Nonetheless, it's not exactly uncommon -- Kid Eternity and The Spectre are two fairly famous examples of the phenomenon, not to mention Deadman and lesser-knowns like Captain Triumph, Mister Justice, Maureen Marine and more than a handful of others. Death seems to be quite a motivator in the four-color world of comics. Me, I'm a "carrot" kind of guy, as opposed to a "stick" kind of guy, in that I hope to be killed by a carrot and then come back as a ghost superhero. Fingers crossed. 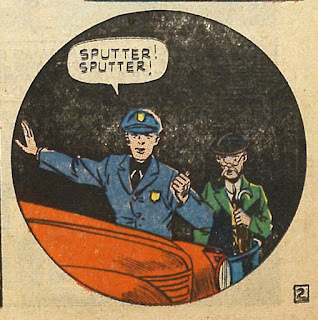 The Spectre, in particular, is simply the best-known of a particular sub-genre of the whole phenomenon: The Murdered Cop Sent Back To Wage A Supernatural War On Crime. I capitalized all of that so that it can seamlessly be added to TVTropes, where it can be best misunderstood by the greatest number of people. Besides The Spectre, there's also The Duke of Darkness, Sgt.Spook, Nemesis aaaaand The Collector, the ghost of a murdered cop who may never have been intended to be a recurring character in the first place. "...Thunder shatter boom boom boom!" The Collector debuts in on of the two issues of the short run of Mask Comics, a Rural Home production, which is always good for some odd talk. 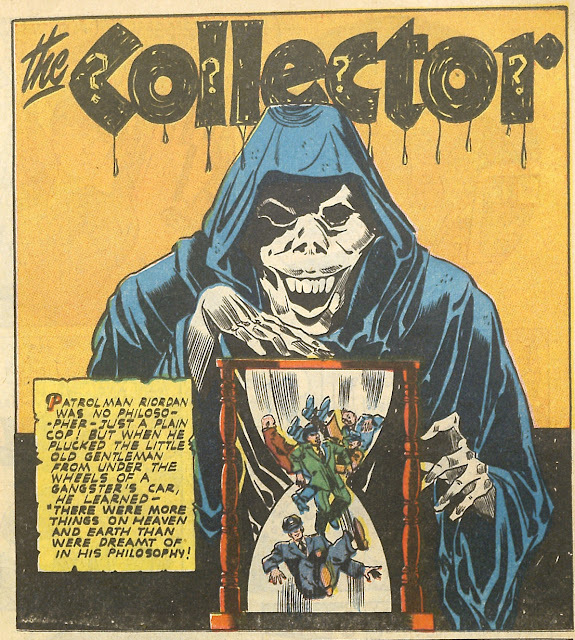 In fact, The Collector -- despite having his name on the splash page and being the star of the story, is an adjunct to the terror-tale-telling horror host-type character, The Shroud. Introducing the tale, the Shroud performs one of the two necessary functions of a horror host and fucks right off after the introduction. The other mandatory task is appearing periodically throughout the story to sass-mouth the inevitable victim of the tale, which he doesn't do. He's either in the shitter the whole time or out back getting high and waiting for a pizza delivery that he'd intended to but forgotten to call in. This is my headcanon of The Shroud. I'm also 'shipping him with The Crypt Keeper. Police officer Hanson Riordan is frustrated with his assignment as a traffic cop, having joined the police force with the same goal as every police officer: murder black kids and hide the evidence. Also, to become a detective and catch crooks. What he gets instead is an ulcer and a sore throat, hollering at speeding drivers from one of those elevated tin buckets they used to make traffic cops stand in at intersections, so as to seem more abused by the folly of mortality. "Open up, you're overdue on the rent!" He does happen to witness Gus Gorilla, notorious gangster, almost running down a hapless little man (whom Riordan saves) while speeding through an intersection. Leaping into action, Riordan flings himself onto the running boards of Gorilla's sedan and gets almost immediately murdered in transit. They can't teach those kinds of instincts! Up in "the judgement gate," the bowdlerized afterlife of this story, Riordan is confronted with the alarming fact that he wasn't intended to die. In fact, it was Gus Gorilla who was supposed to bite it, having crashed into the little man and losing control of his car. Why? 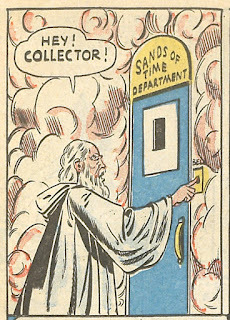 Because the little man was "A Collector," a supernatural figure who engineers accidents and such on Earth so as to bring the souls of the destined-to-die to their final judgment. Something about this system seems rigged. Riordan is recruited as a Collector himself, tasked with killing tough crooks and sending them to heaven for judgment according to their deeds and sins. Along the way, he picks up a wonderful assortment of ghostly powers, such as super-fast running. Actually, that's all he has time to do -- the origin story, preceded by The Shroud eating up the first page of the story, leaves Riordan exactly two pages to show off his supernatural abilities. I'm sure he could do much better with three pages. There's no second adventure of the character, although a final caption suggests that he might get around to collecting Hitler and Tojo, "if he isn't too busy." I dunno, I'd clear my calendar for that, myself, but I'm the guy who got killed by a carrot. Oh my God, this is awesome! 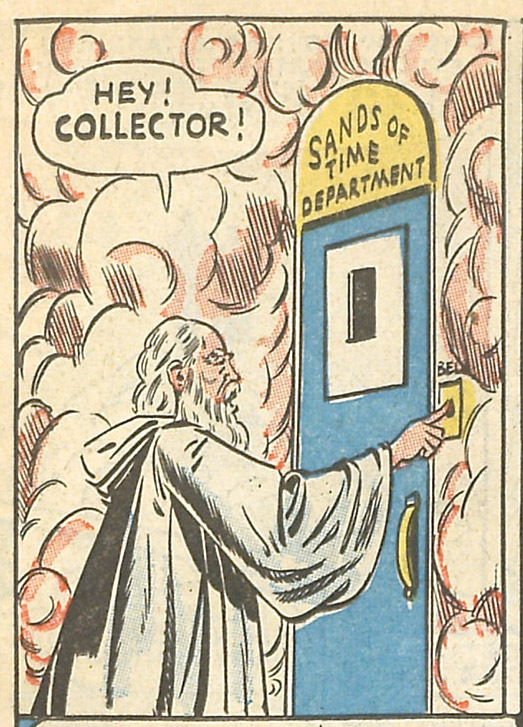 Like somebody put Sub-Mariner, Kid Eternity and...I dunno, Miss America? ...into a blender. I gotta see more of this! Hey, watch the hands, grampa. Within minutes of posting I'd glomped the entire Blue Circle run, including that issue renamed Roly Poly Comics (Cthulhu save me, I have lived long enough to witness ingrates complaining that the Internet makes things TOO accessible), but I'm still going to enjoy your take.